A stone's throw from Oxford Circus and the best shopping London has to offer, this little eatery is the perfect place to take a break from your hectic retail schedule for lunch or to build up your strength over dinner before tackling the journey home with all those designer bags. Authentic decor is mixed with minimalist modern touch to create a calming, relaxed space. Reasonable prices, reliable cookery and speedy service make this restaurant a popular choice for a Thai meal. This is a great spot if you�re looking for a tasty quick meal at an affordable price. Service is quick and reliable. The restaurant can accommodate up to 60 guests. You can also book half the restaurant with other dinners there. Menu options are from the set menu or a la carte. 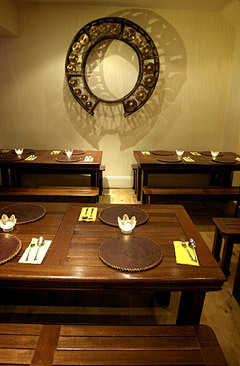 The menu features a range of exquisite dishes made from authentic Thai ingredients freshly flown from Thailand. Green & red curries, pad thai, massaman curry � but flavours are intense & punchy. Salads are a good option for those wanting something light. There is a separate menu for vegetarians.